The passenger compartment remained stable during the impact. The dummy results showed that the front seat passengers' knees and femurs were well protected and Mercedes were able to demonstrate that the car would provide similar protection to occupants of different sizes and to those sat in different seating positions. The car scored maximum points for its performance in the side barrier impact. In the more severe side pole test, poor protection of the chest was reflected in high dummy readings for rib deflection. Protection against whiplash injuries in a rear impact was marginal. A system is available as an option on the C-Class which automatically recognises when a child restraint is fitted to the front passenger seat and disables the airbag. The system was not fitted to the test vehicle. Without it, a rearward facing child restraint should not be used in the front passenger seat as the airbag cannot be manually disabled. Cars with serial numbers from WDD2040071A159633 have a permanently attached label warning of the dangers of using a rearward facing child restraint in the passenger seat without first disabling the airbag. Earlier cars would not have qualified for the 2 points awarded to this label. The presence of ISOFIX anchorages was not clearly marked. The bumper scored maximum points for its protection of pedestrians' legs. However, the bonnet was rated as predominantly poor for the protection offered to pedestrians' legs by its front edge and to adults' heads by the bonnet surface. 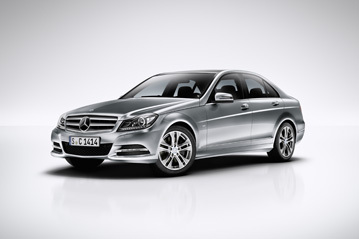 Electronic Stability Control is standard equipment on all variants of the C-Class. A seatbelt reminder is standard for the front and rear seats.